Beautiful Tuscan villa with private pool and stunning views. Beautiful Tuscan villa with private pool and stunning views, Casa Peggi is a truly romantic hideaway with a spiritual feel. The villa boasts 5 bedrooms, 3 bathrooms [2 on suite] a new kitchen & lounge and cool sitting room in the cantina. Three of the bedrooms have double beds [one a lovely four poster] the other two bedrooms have single beds. There is also a sofa bed and two cots for any babies. There are two external eating areas; one, a vine clad terrace with stunning views to the villages across the valley, the other, a romantic stone hideaway next to an old pizza oven, perfect for watching the fireflies in June. The Villa has central heating and a wood burning fire and stufe, so is perfect for winter and autumn breaks when you can enjoy beautiful walks in the woods full of chestnut trees and porcini. The pool is set to the side of the Villa with terra cotta paving and grass banks with steps leading into the shallow end - perfect for children and elderly relatives.There are 8 sun loungers and several deck and director chairs. The views of the distant mountains are stunning and the Villa is set in 10 acres of woodland and gardens yet is only 1 km from the nearest village and shop; secluded not isolated. The house can sleep up to 11 people and the prices listed are for the whole house; However, if you are a smaller group, please feel to contact me and discuss a price for your party. Winter Breaks: The price for holidays from November until the end of march does not include the gas for central heating this is paid locally at a rate of 150 Euros per week or 25 euros per day for short stays. It does, however, include the cost of logs so please feel free to stoke up the fire and roast some local chestnuts! The area is known as The 'Garfagnana' and is often described as the Lungs of Italy with its tree laden hills and mountains contributing to the freshest of air. Most of the area is a designated national park, full of Deer, wild boar, eagles and a multitude of wild life. Fantastic for walks, biking, mountaineering, canoeing, riding and just relaxing and taking in the scenery. Garfagnana is also known for its food and many types of long forgotten vegetables, fruit and cereals are still grown, eaten and enjoyed in the many splendid restaurants and cafes. Garfagnana is also ideally positioned to explore the history of Tuscany with the splendid walled city of Lucca only 40 Kms away and Florence an hour and a half away. For those of you that like to take in the beach life, Viareggio and the Tuscan Riviera is an hour away. The House is fully equipped with all the appliances you need, dishwashers, Washing machines, double oven, 6 burner stove, fridges and freezer. There is an docking station for ipods/ipads and laptops, a wifi internet system, television, Dvd player [with a collection of Dvd's] plenty of books and games. There is also Bbq equipment and a fire pit for outside cooking or just sitting by the fire late at night and watching the shooting stars. Children are welcome and love exploring the gentle sloping wooded terraces and playing in the pool, the house is also suitable for the elderly [my 83 year old uncle loves it!] but please be aware that it is on a hill and the house is on tree floors so is not ideal for wheelchairs. Due to the nearby farms and allergy concerns we cannot allow pets, sorry, and for similar reasons we ask smokers not to smoke in the house but use the outside areas. Our daughter spent her first few years with us in Tuscany by the sea and we were always returning year after year, then in 2007, after looking for many a year, we found Casa peggi. If you come and stay you will realise why I had to buy it. Once you see the view, walk in the Hills, breathe in the air, eat the food meet the locals, you will understand why this house. My heart is lifted every morning and pressures disappear, it is a great place to re-charge my batteries and, maybe, yours. Makes my heart sing, nothing else to add! Fresh clean towels and linen are provided on a weekly basis, there are also additional towels for the swimming pool. A daily maid service is available on request at additional rates paid locally. It is also possible to arrange for a chef and catering for dinner parties and large events. If you would like individual tailor made tours of the local area and further a field, with or without a driver, this can also be arranged locally through an English and Italian speaking friend. Total rural relax with amazing views! Beautiful house, really comfortable, everything needed for a relaxing stay. Plenty of room for all of us. Pool was gorgeous, salt water was much nicer to swim in. The views were amazing. Owner really helpful, lots of useful information. We loved the wildlife - woodpeckers, eagles, deer, boar and grass snakes! Lots of gorgeous local food and friendly people. Only issue - not enough mirrors in bedrooms! We had a fantastic holiday, was exactly what we wanted and will definitely visit this area again. Thank you for your kind words, Yes apologies for the mirrors one or two other guests have commented on that [Jeanna and her Russian friends you met in particular!] As I get older the process of watching the aging no longer appeals to me, I will rectify soon. Villa Peggi was ideal for a family holiday for 3 generations. Not only is the house well equipped with plenty of room and a delightful shady loggia outside for meals but the pool was great and in constant use as we had a week of blazing sunshine. Unfortunately it is not fenced off securely which was a bit of a worry with young ones. An added bonus was the places of interest nearby - Lucca, which is well worth a visit, the market in Garfagnana and the Grotto del Vento caves. We also had a lovely day down at the river where the 'water shoots' were a hit with the younger ones. A wonderful week thoroughly enjoyed by all. Thank you for your comments, it was a pleasure to have you as our guests. I note your comments about the fence around the pool and see if I can make an addition to secure it further. In the first 24 hours: The pool was unusable, green algae and rotting vegetation on the pool bottom, with insects swimming underwater. The water went off for 12 hours, and the wi-fi was off for 2 hours. The owner became abusive when I telephoned him. We left the next morning and are still trying to get a refund for what was a 14 night holiday.. I wasn't quite prepared for the stunning beauty of the location. The house was clean, welcoming and full of charm. It was well equipped and to have bread and other essentials awaiting our arrival was a godsend - not to mention the bubbly in the fridge! Couldn't keep the kids out of the pool. Perfect holiday. My Family [Husband, 3 children and my sister and Husband plus 2 children] spent and an Idyllic week at Casa Peggi. From the warm welcome and the welcoming glass of prosecco to the end fond farewells the week was perfect! The Children loved the pool and spent hours and hours splashing and laughing; having a salt water filter system meant that they could play without any issues with chlorine they loved it. Local restaurants were friendly and good value, on the day when it rained [it poured down!] we went to Lucca and that was beautiful, full of history and fantastic ice cream. Thank you for your kind review, I remember that storm it was huge! The beauty of Tuscany is that the blue skies soon return and if it means you have to spend a day in Lucca and eat ice cream; how bad is that. We were two families, of four and six, with children aged from 3 to 13, and everyone was enchanted with Casa Peggi. The house has been beautifully furnished with a particularly well-equipped kitchen (we cooked most evenings) where you can gaze out at the misty mountains while stirring the risotto. Look out for Monte Forato in the far distance ("What is that, a hole? Does that look like a hole to you??!"). The upstairs bedrooms have wonderful views over the valley, and downstairs the cantina bedroom is cool and quiet away from the others. No need to overrun the baggage allowance with toys and beach towels, there's lots to choose from, as well as maps & local information, a very varied and interesting book collection, and dvds. We didn't get back in the car for three days after arriving, we were so relaxed and at home. The weather was almost entirely sunny with a couple of night showers - just enough to keep the tomato plants happy. The children swam, played football behind the house, chased lizards and beetles. We walked, looked at the view, watched the fireflies, chatted, read, ate, drank... Once we started to feel a need to commune with our host country, the house is very well placed for visiting Barga and Castelnuovo, and Lucca slightly further afield (hire a bike for six!). For stocking up, there's a hypermarket in Gallicano about 15 minutes drive away where you get anything from farro to footballs. The owners were more than helpful, even with last minute emails the day we travelled (it's a good idea to get some directions for the last bit of the journey up the hill, as Google's were mystifying, once we turned off towards Fosciandora). The local housekeeper who met us on arrival (perfect English) was justifiably proud of the house as she showed us round and happy for us to contact her with any problems during our stay (we had none). I would recommend Casa Peggi absolutely, and I hope we'll be back. 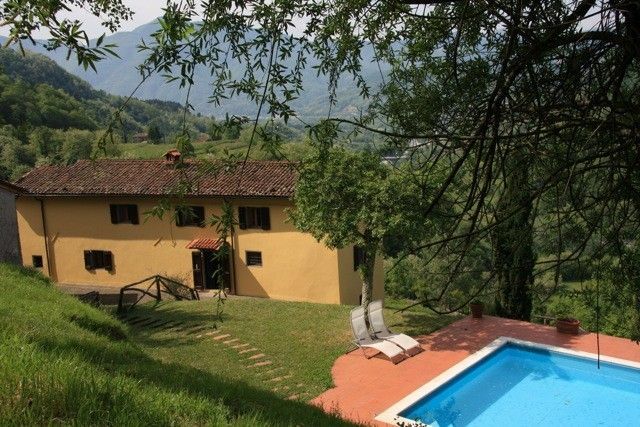 Casa Peggi is an old farmhouse in a quiet sunny location in the National park of Garfagnana, lovingly renovated and restored with all services and fittings modernised, to create a stunning home that provides comfort and style in a tranquil setting. The Garfagnana area is famous for its food, with cheeses, wines honey and chestnuts famed throughout Italy. The Salami and wild boar are a must for non vegetarians and there are many restaurants that specialize in the local foods and shops in towns and villages nearby where you can buy excellent local produce to cook at home. The local area of Fosciandora is also famed for its Porcini Mushrooms, the locals will help you out and supply a few if you are not an expert in finding them yourself! A walk through the wooded hillsides will certainly reward you with some fabulous views and scenery and I am sure you will come across a local farmer who will gladly sell you home made foods but you usually have to share a glass or wine or two! The local village, Riana is only 10-15 minutes walk away and is a charming village with a shop and bar. The village centre has a lovely church beautiful little houses, hidden Alleyways and with a little playground. You can also find banks, a post offices, bakeries and restaurants in the many towns a further few kilometres away. The nearest large supermarket is 15 minutes drive away in the historic town of Gallicano, which has a good fresh fish counter, plenty of meats and all the food you will need. It also has many household and garden goods, toys and even some clothes. The historic and beautiful town of Barga, 15 minutes drive away, and is very much worth a visit during your stay. Lovingly restored by the Italian government in recent years, the town founded by the Lombards and was built around the trade for silk and was rightly famed and fought over for centuries. This is a lovely place to come and wander around the shops and twice-weekly market, have lunch in and see the fine architecture and peaceful squares. Walking in the hills around Casa Peggi is another lovely way to spend some time. There are several local walking routes meandering between villages, showing you the local flora and fauna and beautiful views of the surrounding area. A day at the beach is another option; about an hour's drive away is the Tuscan Riveria with the famous towns of Viareggio and Forti di Marmi, The beaches are all manicured with umbrellas and loungers for hire, drinks and lunch delivered to you, all at a cost! For those who prefer a less organised more carefree feel the beaches south of Viareggio are all sand dunes and pine forests. A refundable security deposit will be payable of £250 at the commencement of your holiday and returned to you on your departure.